The bears at McNeil Falls. The largest known gathering of brown bears in the world happens at McNeil River. Visitors get an unparalleled opportunity to watch the bears feeding, fighting, playing, and mating. In early July, as chum salmon return to the river to spawn, a series of cascading rapids and pools slows their migration making them easy prey for hungry bears. As many as 74 bruins have been observed in the area of the falls during the peak of the run in late July. 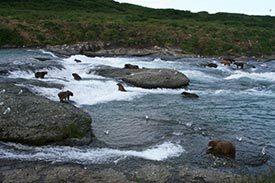 Earlier in the season, red salmon returning to adjacent Mikfik Creek also draw bears, which plunge into the cold water in pursuit of the darting fish. Visitors may also see harbor seals, red fox, and a great diversity of birds, including cormorants, harlequin ducks, bald eagles, glaucous gulls, and songbirds. Apply by March 1 for a permit to visit the popular sanctuary. Permits are awarded through a lottery and are valid for an assigned four-day period between June 7 and August 25. 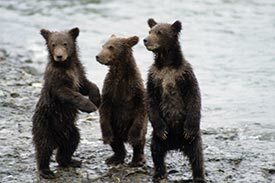 Each day, up to ten permit holders hike to one of the bear viewing areas, accompanied by an Alaska Department of Fish and Game naturalist. Typically, groups spend six to seven hours watching and photographing the bears. Visitors camp at an established campground and cook in a nearby cabin. For additional information visit the McNeil River State Game Sanctuary website. Although the sanctuary is accessible by boat, virtually all visitors fly from Homer to the McNeil River area using one of several air charter companies. 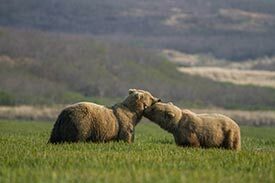 ADF&G (907) 267-2189 or visit the McNeil River State Game Sanctuary website.